Today’s choice is sweetly vintage. But how do you spell it? Thanks to Katie for suggesting one she’s considering for her baby-on-the-way. 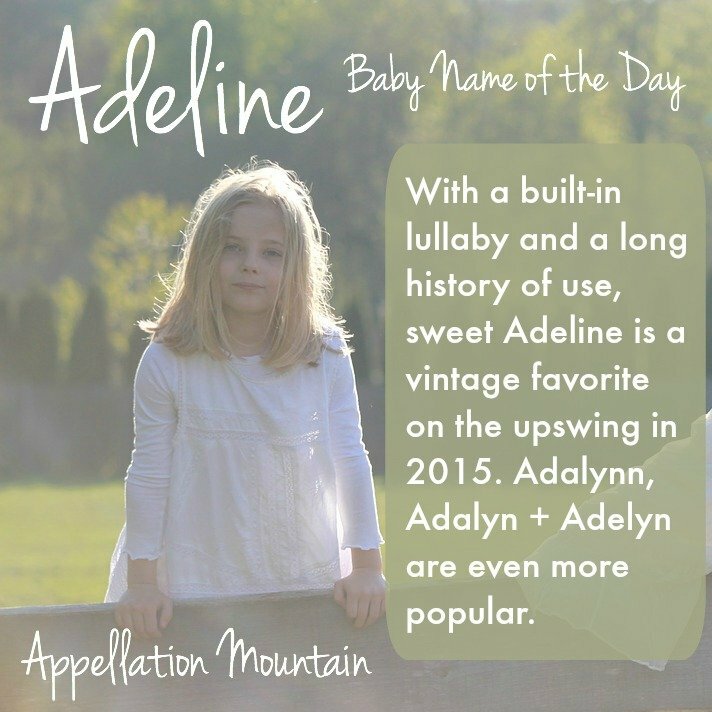 Our Baby Name of the Day is Adeline. The -ine ending is used to create feminine forms, diminutives, or both. Think of Caroline and Josephine. Adeline is simply a French nickname form of Adele that has long since stood on her own. It was a Top 200 choice for girls in the US from the 1880s into the 1920s. The new name might have been inspired by opera legend Adelina Patti. The acclaimed Spanish-born soprano was on a farewell tour of the US in 1903. What’s certain is that the song quickly became a staple for barbershop quartets. In 1945, Sweet Adelines International was formed, a society to promote women’s a cappella singing. The Marx Brothers have covered it. So has Phish. NPR did a story on the 100th anniversary of the song. There are lots of great girls’ names used in songs, but few as enduring. The family of related names is huge, from Adelaide to Heidi, all from the Germanic Adalheidis – noble one. And even more formal names for Addie are possible. Addie Ballou, born Adeline in 1838, and a leading suffragette of her day. It was the given name of Addie Kerrar, who played for the Rockville Peaches in the All-American Girls Professional Baseball League. The Peaches were immortalized in 1992’s fictionalized account in A League of Their Own. The scandalous Victorian-era Countess of Cardigan was an Adeline. She was briefly engaged to a Spanish prince before the much older Earl of Cardigan left his wife for her. Later in life, the dowager Countess wrote a tell-all memoir titled My Recollections. It was the given name of several writers, including one who preferred to use her middle – Virginia Woolf. After more than four decades of neglect, Adeline re-entered the US Top 1000 in 1999. By 2006, the name had cracked the Top 500. And Adeline charted at #232 and climbing in 2013. 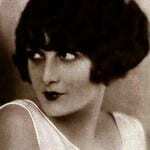 Ada is also on the upswing, thanks in part to the popularity of Top Ten favorite Ava. All of the Addie names are following the Maddies up the charts. And just as there are multiple spellings of Madeline and Madison in the US Top 1000, there are plenty of variations of Adeline, too. None of this detracts from Adeline’s sweet, vintage appeal. But it does mean that this name might feel much more popular than the numbers initially suggest. Vintage, spirited, and with a story to tell and a song to sing, no wonder parents have fallen hard for Adeline in recent years. But be prepared to meet other girls by the same name – though not necessarily the same spelling! What do you think of Adeline? Do you have a favorite spelling? I wish I could find a baby-name popularity list that takes into account alternative spellings and even slight variations like Adeline/Adelyn. In other words, if you add Adeline and its “cousins” together, just how popular is it these days? Top 10? Top 5 or 3 even? Is there an accurate 2016 list that combines variations? Her new tally puts Adeline at #6! She only (ha!) considers the Top 1000, and only lists the new Top 50 – but it’s still a good measure of what’s really happening when spellings are combined. My boyfrie nd’s cousin just had a little girl and named her Adeleen, pronounced “Add- a- lean”. I’ll be honest, I don’t know how to pronounce Adeline. Is it like Madeline without the M? Or is it with a long a, like “Ada-lynn?” Or “Ada-line?” I love how the Adeline spelling looks on the page, but in my head there at least three possible pronunciations. I have a friend that named her daughter Madeline and pronounces it “Mad-eh-lynn” though, so I imagine people will do the same with Adeline. Such a sweet name. I always think of the song when I hear the name. I had a great-aunt Adeline growing up, who was the sweetest lady. I’d always found her name beautiful and different and I’m so glad it’s becoming more popular!